Jane KAY was born in England circa 1840. [S542] Index - New Zealand BDMs online, at http://www.bdmhistoricalrecords.dia.govt.nz/, Death Reg. No. 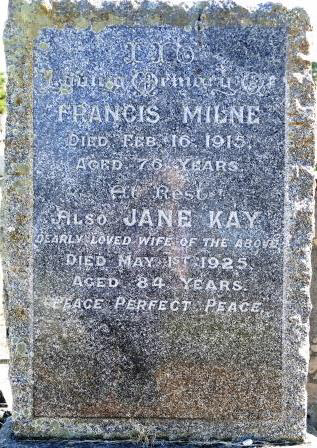 1925/4129, aged 84, as Jane Kay MILNE. [S419] Christchurch City Council Cemeteries database, at http://librarydata.christchurch.org.nz/Cemeteries/, Block 34, plot 324, widow, of Scotland, aged 84, of 124 Jeffreys Rd, Christchurch. years in NZ - 51. [S863] Newspaper - New Zealand Herald, issue of 30 Aug 2000 (depositions hearing to determine whether former Ansett captain Garry Southeran was to go on trial). Frances Harwood KEANE was born in Auckland circa 1850. [S542] Index - New Zealand BDMs online, at http://www.bdmhistoricalrecords.dia.govt.nz/, Marriage Reg. No. 1868/4754. [S418] Ancestry.com - misc sources, at http://www.ancestry.com/, California, Death Index, 1905-1939, page 3005, aged 84. [S542] Index - New Zealand BDMs online, at http://www.bdmhistoricalrecords.dia.govt.nz/, Marriage Reg. No. 1924/4756. [S542] Index - New Zealand BDMs online, at http://www.bdmhistoricalrecords.dia.govt.nz/, Death Reg. No. 1972/40800 gives this birthdate. [S542] Index - New Zealand BDMs online, at http://www.bdmhistoricalrecords.dia.govt.nz/, Death Reg. No. 1972/40800. [S866] Rotorua Lakes Council Cemetery database, at https://www.rotorualakescouncil.nz/our-services/…, Block 7, Section 41, plot 12. [S542] Index - New Zealand BDMs online, at http://www.bdmhistoricalrecords.dia.govt.nz/, Birth Reg. No. 1889/7287. [S542] Index - New Zealand BDMs online, at http://www.bdmhistoricalrecords.dia.govt.nz/, Death Reg. No. 1890/3232, aged 1. [S265] Book - Edgar T. Jones, George & Martha Clarke Family Tree, p27. [S312] Electronic Files - A Robinson, and subsequent correspondence, His data obtained from www.myrasplace.net, genealogy of Beniston family line. Son of James Kemp. [S542] Index - New Zealand BDMs online, at http://www.bdmhistoricalrecords.dia.govt.nz/, Birth Reg. No. 1858/1191. [S312] Electronic Files - A Robinson, and subsequent correspondence, His data obtained from www.myrasplace.net, genealogy of Beniston family line. [S443] CD - NZ Marriages, CD - NZ Marriages 1836-1956 V2, NZ Registrar General's Folio 9. [S542] Index - New Zealand BDMs online, at http://www.bdmhistoricalrecords.dia.govt.nz/, Marriage Reg. No. 1887/2375. [S542] Index - New Zealand BDMs online, at http://www.bdmhistoricalrecords.dia.govt.nz/, Death Reg. No. 1941/24075, aged 82. [S542] Index - New Zealand BDMs online, at http://www.bdmhistoricalrecords.dia.govt.nz/, Birth Reg. No. 1898/4187. [S542] Index - New Zealand BDMs online, at http://www.bdmhistoricalrecords.dia.govt.nz/, Death Reg. No. 1947/17256, aged 49. [S338] Varcoe's NZ Marriage Index, at http://marvin.otago.ac.nz/marriages/, Folio 3. [S443] CD - NZ Marriages, CD - NZ Marriages 1836-1956 V2, NZ Registrar General's Folio 3. [S542] Index - New Zealand BDMs online, at http://www.bdmhistoricalrecords.dia.govt.nz/, Marriage Reg. No. 1858/4. [S542] Index - New Zealand BDMs online, at http://www.bdmhistoricalrecords.dia.govt.nz/, Death Reg. No. 1904/572, aged 81. [S542] Index - New Zealand BDMs online, at http://www.bdmhistoricalrecords.dia.govt.nz/, Birth Reg. No. 1893/16945. [S312] Electronic Files - A Robinson, and subsequent correspondence, NB: no matching entry in NZ BDM indexes. [S443] CD - NZ Marriages, CD - NZ Marriages 1836-1956 V2, NZ Registrar General's Folio 556. [S542] Index - New Zealand BDMs online, at http://www.bdmhistoricalrecords.dia.govt.nz/, Marriage Reg. No. 1916/3511. [S542] Index - New Zealand BDMs online, at http://www.bdmhistoricalrecords.dia.govt.nz/, Death Reg. No. 1952/27102, aged 59. [S312] Electronic Files - A Robinson, and subsequent correspondence, 2nd Daughter of James & Charlotte KEMP. [S443] CD - NZ Marriages, CD - NZ Marriages 1836-1956 V2, NZSG collection, entry 3515 (although claims to be for 1852). [S542] Index - New Zealand BDMs online, at http://www.bdmhistoricalrecords.dia.govt.nz/, Death Reg. No. 1882/3387, aged 56.